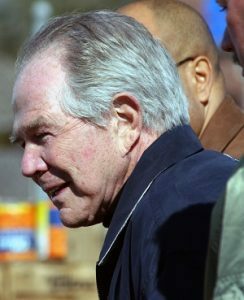 Pat Robertson is back, this time with a prayer that, he claims, will send Hurricane Florence spinning harmlessly out to sea. The famous televangelist spoke from Virginia and called for the men and women assembled to help him put a “shield of protection” around the Tidewater region to protect it from the storm barreling down on it. Robertson cited Mark 4:38, “When Jesus woke up, he rebuked the wind and said to the waves, ‘Peace! Be still!’ Suddenly the wind stopped, and there was a great calm. Then He said to His disciples, ‘Why are you so afraid? Do you still have no faith?’ And they were filled with fear and said to one another, ‘Who is this then, that even the wind and the waves obey Him?” Robertson’s goal was to have him and his congregation enact a very similar miracle. Instead of silencing a thunderstorm on an inland sea, however, they were hoping to stop the Category Four hurricane that is roaring across the Atlantic. Robertson’s gesture is appreciated, but most people are doubtful that his spell-like prayer will actually dispel the storm that is set to make landfall in the Carolinas in just a few days. Instead, they are either evacuating or bracing themselves for the hurricane’s arrival and are praying less about a mystical shield and more for the protection and safety of all those who are preparing to face down mother nature’s wrath.